If you've seen my Twitter or Instagram story lately, you'll know that I made a little designer purchase. After years of lusting after it's sibling, the Rocco, I finally took the plunge and purchased an Alexander Wang Rockie. 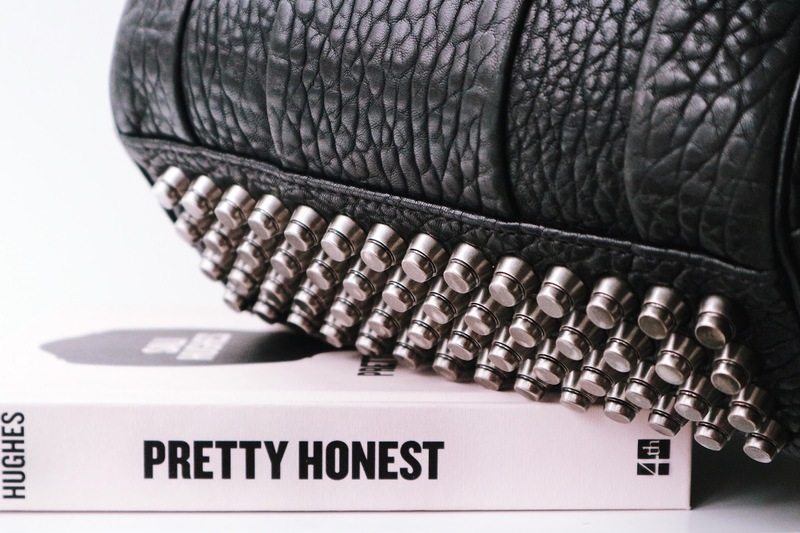 I've had my eye on these bags for years - no exaggeration. They were the 'it' bag a few years ago with a cool handful of celebrities carrying them every so casually. Now I'm clearly no celebrity.. I'm just a regular gal with a regular income, an obsession with beauty products and an unhealthy prosecco habit so with all of these things combined, I knew I wasn't going to be getting a brand new one anytime soon. 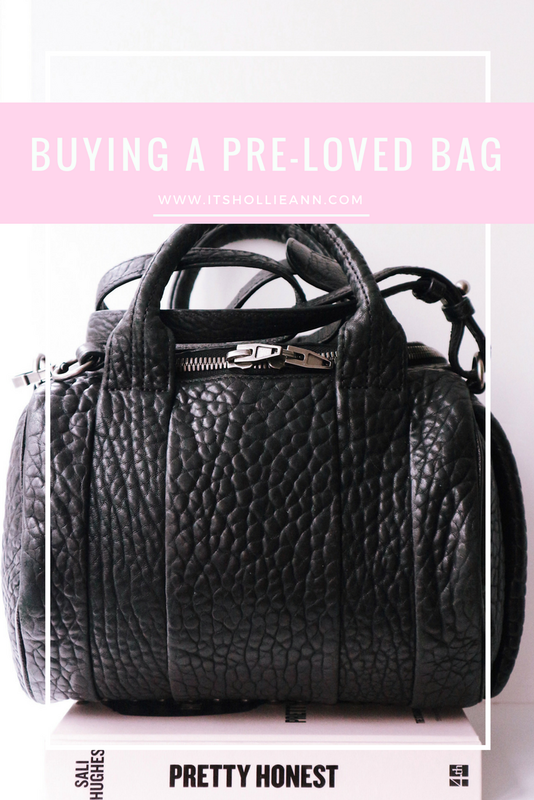 Then it hit me - Why didn't I just buy the bag pre-loved? I'd watched quite a few videos on this subject, especially from the likes of Lydia Millen and Clare Chanelle and then, after reading an informative blog post that Chase Amie had written a few years back, it seemed to be the only way I was going to be able to firstly even afford the bag and secondly, justify spending the money on it. Throughout the whole process I really wanted to make sure that I was spending my money wisely and on something that was legitimate so I thought I'd share what I looked for along the way. Get to know the bag & specs First and foremost, I really wanted to take a closer look at the different finishes it came in. I took a look on the Alexander Wang website at what the sizing and leather was like on models and then took to Youtube, blog posts and sites like Purse Forum to see what people thought. As I mentioned above, I originally wanted a black Rocco with rhodium hardware but after scouting around first off, they are bloody huge and secondly, I couldn't actually find a bag with those specs so who knows if it even existed. I've always known I wanted pebbled leather but in the end the black Rockie in nickel was more up my street. Setting spending limits Not only was it January - aka the longest month ever - when I bought this bag, I also don't really have the funds available to be spending money so freely. I worked out that at that moment in time, I could realistically afford to spend up to £300 which is way over half of the retail value and not to mention a complete bargain in my eyes. Though £300 did still seem like a lot of money, since I'd decided that I wasn't going to buy a bag that was scratched, without a dust bag or without complete authentication I figured it wasn't as much as it could have been. It turned out to be quite a stretch but after weeks of searching, I finally found one. Research various websites Throughout the search process, I probably didn't look on as many websites as I could have but my first stop was always going to be Vestiaire Collective. Vestiaire is such a popular website for buying pre-loved goods and the fact that they authenticate everything before shipping it seemed like a win. I checked the site every day for what I wanted and although there were so many great options, I decided that if I couldn't get the one I wanted then I wasn't going to buy one at all. I also checked websites like TheRealReal and Depop but ultimately I found what I was looking for on eBay. Confirming authenticity As I mentioned above Vestiaire authenticate all of their purchases before shipping so eBay isn't always the best option since you can't guarantee that what you're buying is legitimate. I made sure that the one I picked had all of its tags, receipts and a dust bag etc before bidding and my bag actually came with not only all that but also the tags from when it was previously purchased through Vestiaire so if I ever decide to sell it, I'll have them to pass on. The seller was also super helpful with all of my questions but if it ever goes wrong, they always have Buyer Protection. Overall, I'm so unbelievably happy with my purchase. It's exactly what I wanted and although you can tell that it's been loved, it's still in excellent condition. I'm so glad that I waited until the right one came up because I know it's a bag that I'm going to get an insane amount of use out of - Truthfully I'll probably never take it off. If like me, you're trying to decide between the Alexander Wang Rocco and Rockie, rest assured that the Rockie is the perfect size for everyday use and the zip fastening isn't as awkward as I initially thought. 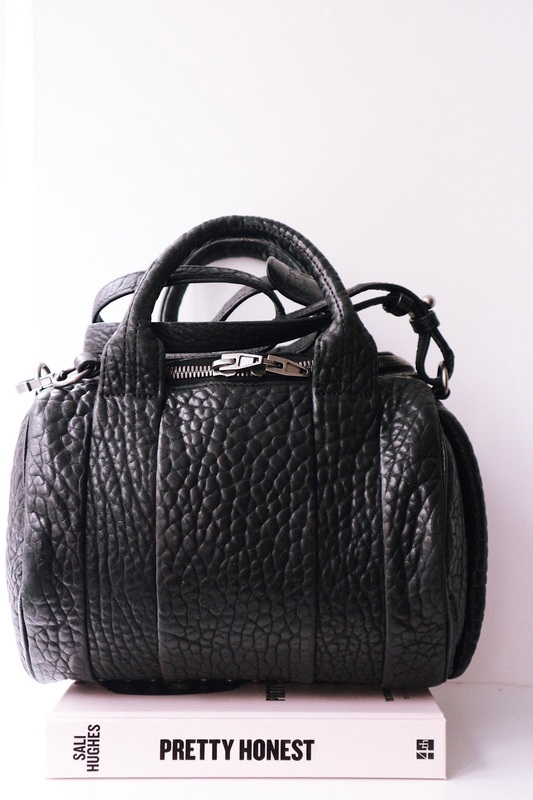 I'd love to know if you've ever or would ever buy a pre-loved designer bag? What kind of things would you look for? I'd love to know ahead of my next purchase!